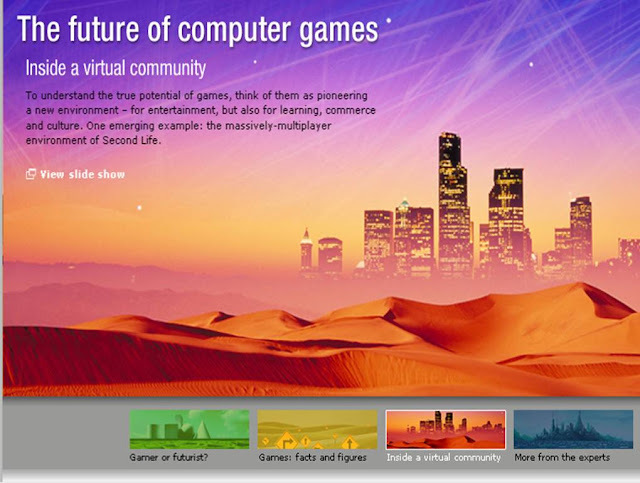 IBM explores how video games may impact every aspect of our world, from education to business, society and culture. What was one a solitary past-time for children has morphed into a social intensive activity. People play games with friends, with family, and in online communities. 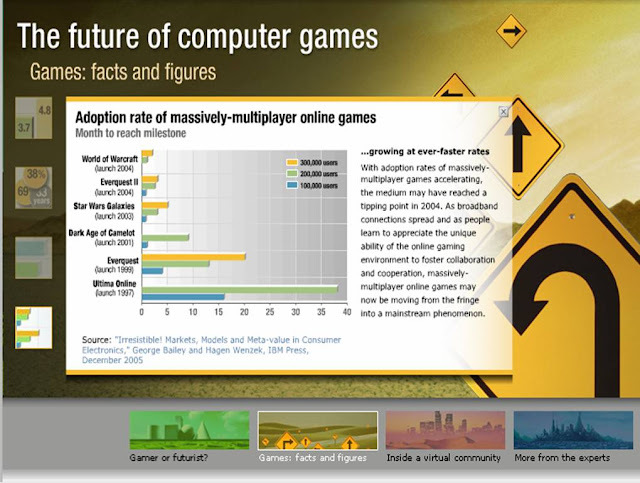 Massively-multiplayer communities are stretching the boundaries of grid computing. 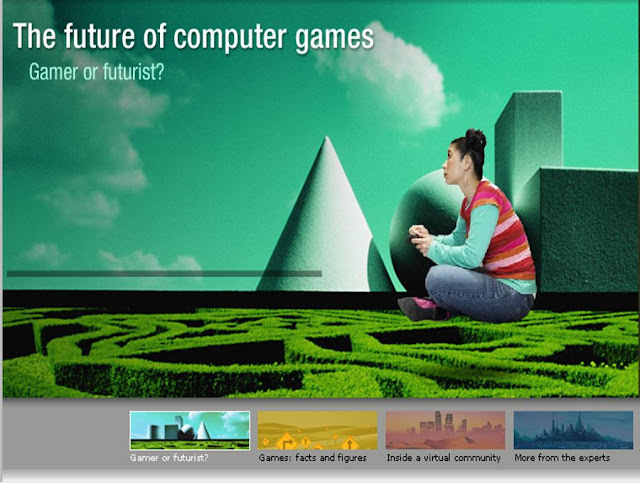 Games are driving demand for an advanced new breed of computer technology, which can render 3D virtual environments in stunning fidelity. To understand the true potential of games, think of them as pioneering a new environment— for entertainment, but also for learning, commerce and culture. These virtualization technologies have many powerful applications, e.g. from telemedicine to medical imaging. Eventually, most work may be performed inside rich, intensively collaborative environments that gamers are pioneering today. Video games sales are driven by the games-console cycle. Every five to six years, console manufacturers such as Sony, Nintendo and Microsoft introduce a new generation of equipment, triggering new growth in games sales. This year marks the start of a new console cycle. According to In-Stat/MDR, next-generation game-console shipments will hit 17m in 2006, 27m in 2007 and 33.5m in 2008. 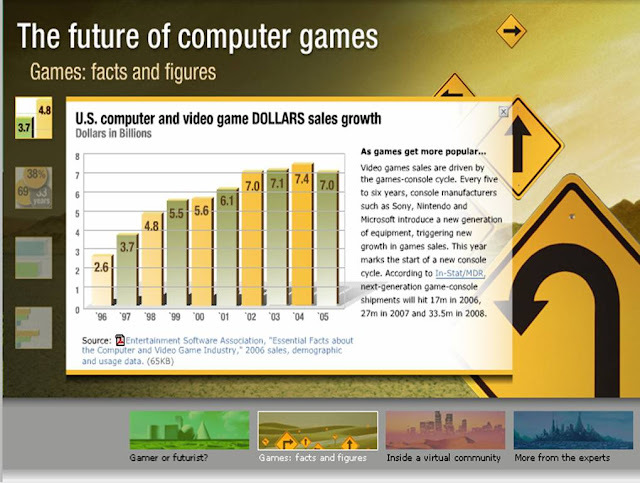 The Entertainment Software Association Report - "Essential Facts About The Computer And Video Game Industry", 2006 sales, demographic and usage data. The stereotype of the solitary, adolescent gamer is seriously out of date. More than two-thirds of gamers are adults, according to the Entertainment Software Association. People who grew up on games continue to keep playing them— though the sorts of games they play tend to change. 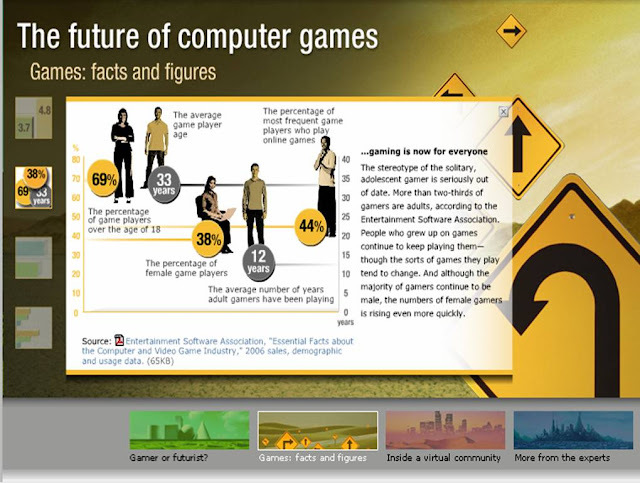 And although the majority of gamers continue to be male, the numbers of female gamers is rising even more quickly. ... and Irresistible! Markets, Models and Meta-Values in Consumer Electronics (December 2005).